Peaches Christ Production - New Show! our live musical parody mash-up of the now-classic films, "First Wives Club" & "Fight Club"... You've never seen (or heard!) anything like it...! THE FIRST RULE OF FIRST WIVES FIGHT CLUB...? TELL EVERYONE! 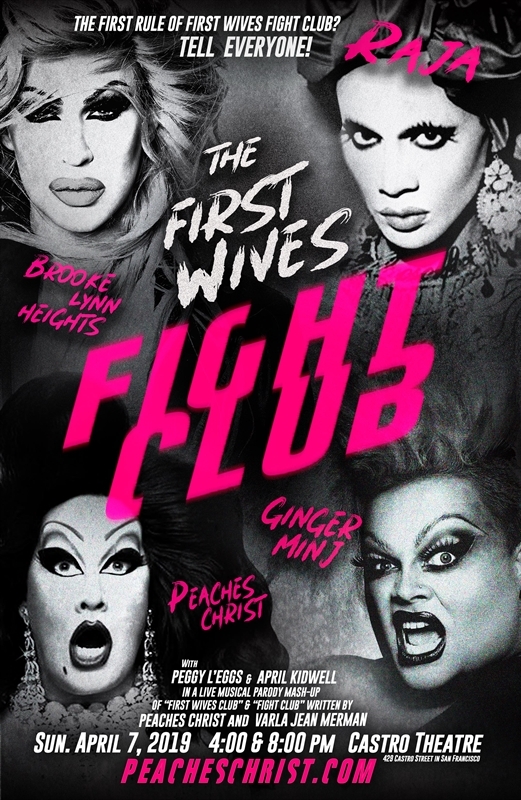 Starring the gorgeous and indelible talents of RAJA, BROOK LYNN HYTES, GINGER MINJ, PEACHES CHRIST! Also starring local favorites PEGGY L'EGGS and APRIL KIDWELL...!